A Las Vegas-based tech-startup is looking to provide protection to small and medium-sized businesses from an unseen enemy. Cyber security issues may go unnoticed or not even considered as a threat by some organizations — until there’s a problem. Troy Wilkinson, CEO and co-founder of Axiom Cyber Solutions, explained that many cybersecurity attacks can come after months of preparation — all while the attackers sit inside an organization’s system undetected. A distributed denial of service attack, or DDoS attack, is essentially a flood of traffic sent to a computer network by a hacker in the hopes to shut down a network by overloading it. Wilkinson went on to describe how hackers that attacked Sony Corp. were inside the system for more than a year before striking. That attack shut down Sony’s PlayStation Network for several days in 2015. 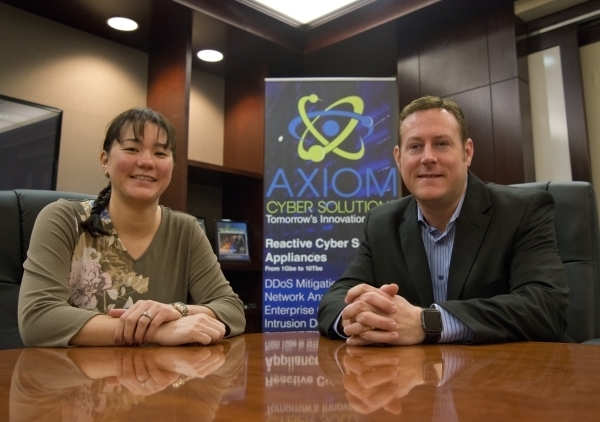 Wilkinson, along with his wife and co-founder, Shannon, are the driving force behind Axiom, which offers protection through a fully managed firewall that guards businesses day and night by its design and with a team of trained experts watching over it. “We also actively take action against it, so the device, our firewall, will prevent the attack and we’ll notify the business to what happens,” said Wilkinson. The couple met in Kosovo during a peacekeeping mission for the United Nations. His experience comes from an IT forensics and cyberterrorism investigation background developed while working for the State Department and the U.N.
Shannon Wilkinson is originally from Montana but is a graduate of UNLV. After years overseas, the couple decided to move to Las Vegas. Upon their arrival, they spent time working for other organizations in Las Vegas but wanted to move in a different direction. “We’ve always worked together overseas. We kind of wanted to find something that we could do together,” she explained. 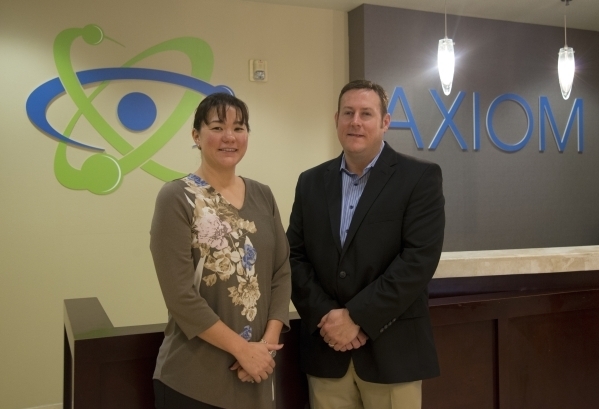 The couple opened the doors to its new venture, Axiom, on July 1. Its offices are located just west of Pecos Road on Warm Springs Road. Axiom is offering three levels of firewall protection with service on a tiered pricing structure, which depends on the number of users and an organization’s Internet connectivity. To get the firewall protection, clients will have to run their systems through a device Axiom supplies them — a different device for each tier. Shannon Wilkinson described Axiom’s devices as plug and play: once you plug it in, Axiom does the rest of the work. A Web-enabled platform is also in development. One of the devices Axiom is offering, the Axiom Sentry, goes for under $200 a month in service fees and handles up to 100 PCs, and up to one GB of connectivity. Other devices are available for larger users at higher fees. Each level offers organizations protection against threats including distributed denial of service, ransomware and data breaches. This is something that Charles Whitby, managing director at EastGate Enterprises, a small and medium-sized business management consulting firm, also thinks is a threat to the local business world. Small businesses have to be more conscious about their budget and look for cost-effective tools, said Whitby. “There are some security tools that cater to the small business that will not cost a lot of money,” he added. One local business taking the notion of security seriously is Altitude Color Technologies. Paul Codi, vice president of operations, said the firm changed its approach after hackers got into the voicemail systems and racked up $10,000 in international calls. Codi said he was already working with Axiom on building a server for Altitude’s file sharing when they were hacked again. This time it was through its 800 line. Axiom representative pitched Codi on an Internet-based phone system and a firewall. Codi is less worried these days. There are some systems on the market that can’t hold up to business-level attacks. Whitby also wouldn’t recommend the off-the-shelf devices. 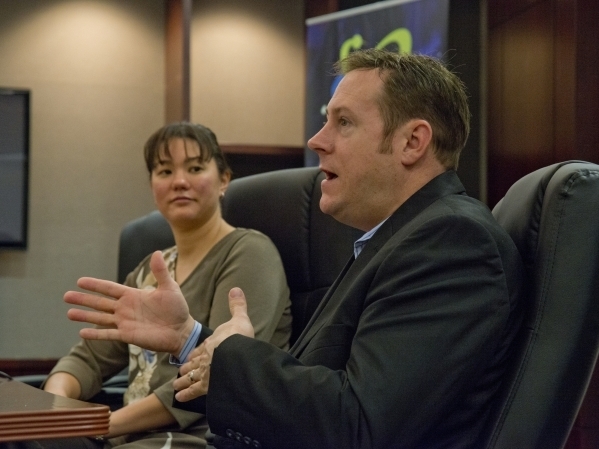 Axiom leaders said they have gone beyond industry standards with their new system. He said the technology is nearly 100 percent effective in a ransomware attack — where hackers get into a system, sometimes through email attachments. A screen usually appears afterward demanding money before allowing a user access to their system files that the hacker has encrypted. Users are instructed to pay the ransom through untraceable forms of currency like Bitcoin. The cost can also be high for businesses that are struck by a DDoS attack. “The average cost to a small business is about $9,000,” said Shannon Wilkinson. She added that one of the statistics out there says 60 percent of businesses don’t survive a data breach or a hack because they can lose customer confidence and loyalty. Axiom has gone beyond Nevada’s borders. The company services a Comcast data center in Pennsylvania, along with clients in Virginia and California.